I meant to post this last week, but with the whole hospital fiasco, I didn't get around to it. Also because of said fiasco, I wasn't able to swap out the tot trays this past week. The older Ethan gets, the less acceptable leaving the same trays up for two weeks becomes. By Thursday of the first week, he already wakes up asking for new trays and gets all cranky when I make him wait for the weekend to get them changed out. Tot School is still his favorite so I'm trying to figure out how to keep everything up to speed to hold his interest again. It's crazy how quickly he's growing up! 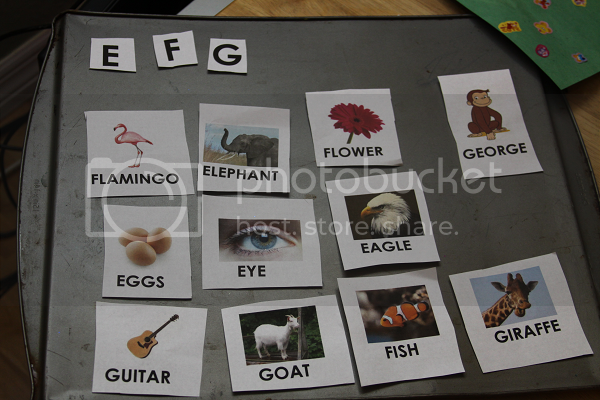 Anyway, this last week (er, or two) were the letters E, F, G. We've already finished the individual letters but are now wrapping up the alphabet a second time in groups. 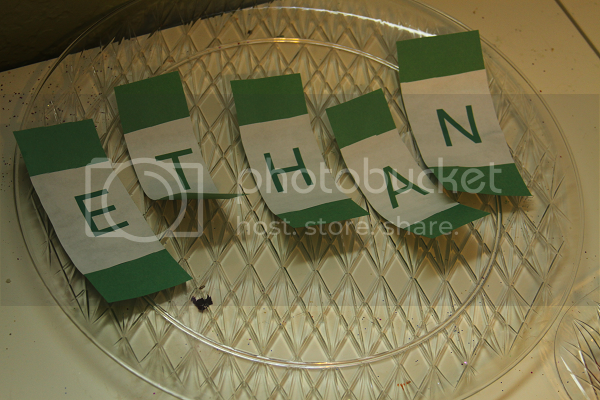 The point of this tray was to help Ethan practice spelling his name. 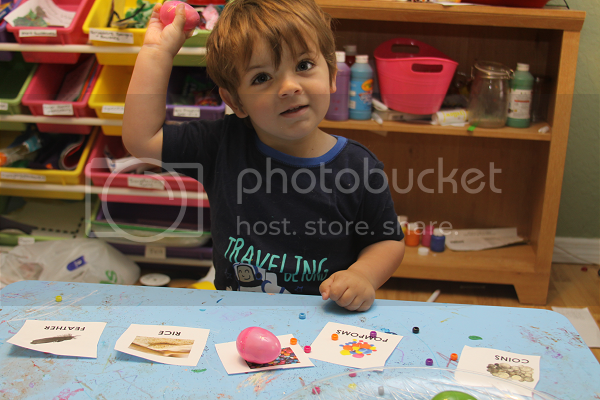 He's getting quick about saying the letters out loud, but it was fun watching him identify each letter and place them in the correct order to properly spell his name! He liked this one, but kept commenting how there were no pictures of him. Whenever we do name trays, I usually include some pictures of him and I guess I dropped the ball on this one. 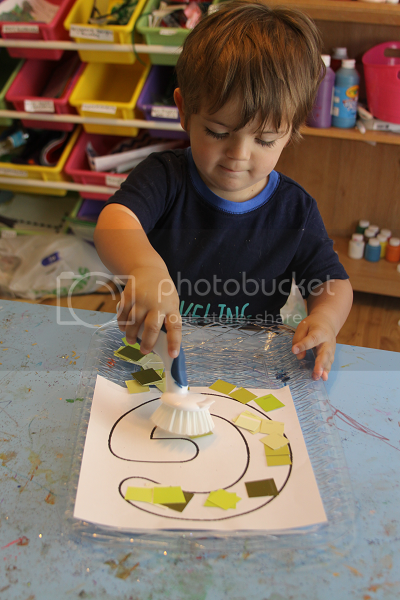 Sweeping was a skill we mastered a long, long time ago, but lately he's been asking for more sweeping trays. This one didn't disappoint -- I'm pretty sure it was his favorite of the week. 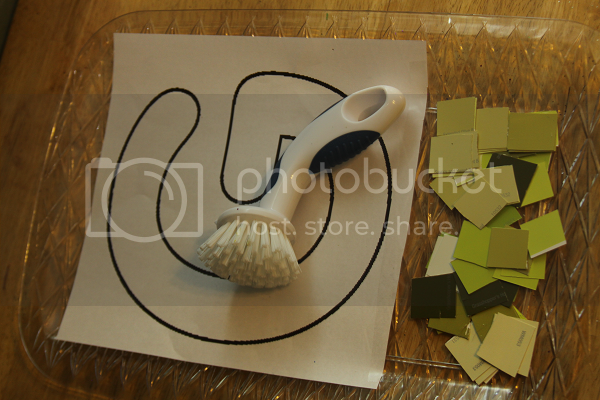 I cut up some green paint swatches and a letter G, and Ethan got to go to work sweeping the green pieces into the G.
This tray had photos of different objects and Easter eggs filled with said objects. 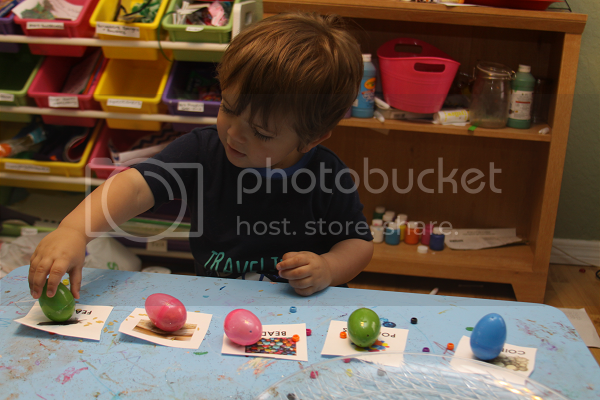 Ethan got to shake each egg, listen to the sound and place it on the correct card. 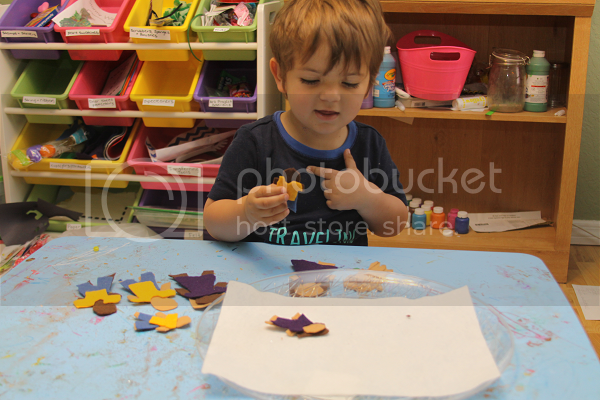 He also loved this activity! 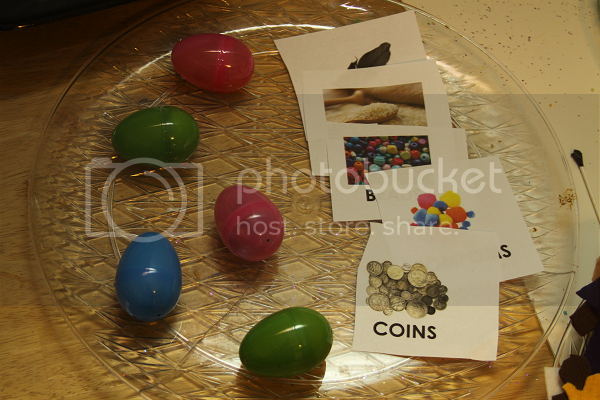 The downfall was by the end of the week, he had started to open all the eggs with the intent to put the objects in different colored eggs. On one hand, it was a good idea -- that way we couldn't remember what color egg held what -- but on the other hand, there were rice and beads all over the floor by Thursday and this tray had to retire early. 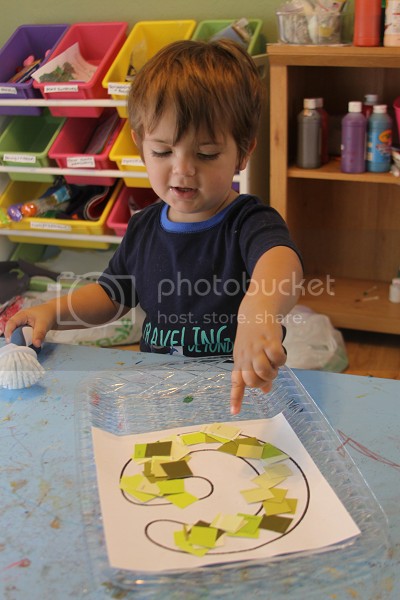 We did more work with sounding out words that begin the letters E, F, G. Unlike last week, he was sort of over the magnet board this week. It didn't get much action. 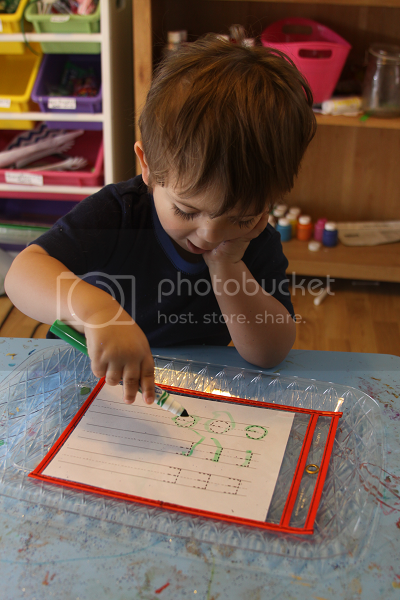 Ethan is still really into the dry erase trays and really loves trying to write his own letters! 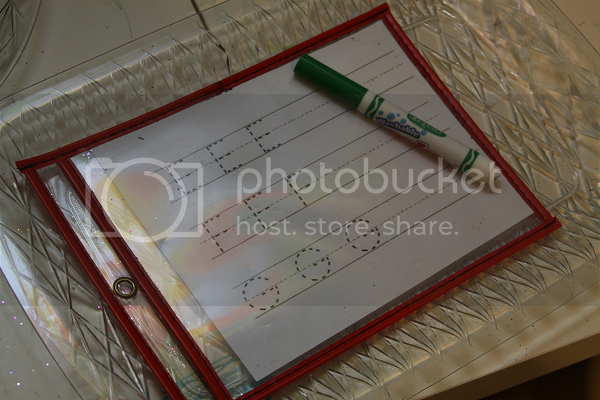 We did a basic tracing tray but also added this one so he could try to make his own letters, too. 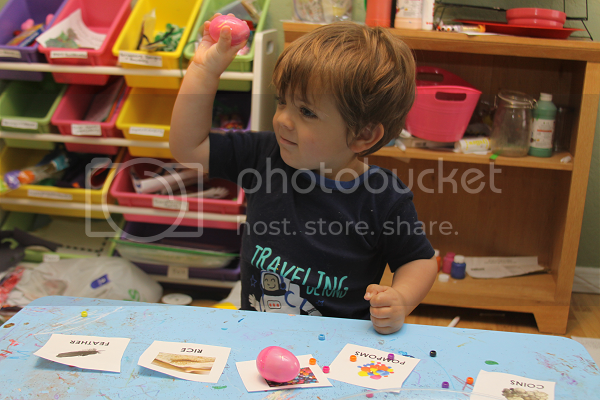 He got a little self-conscious about trying to write his own letters but was trying really hard and doing awesome! This tray was my nemesis! I waited until the last minute to do it, past my bedtime, and had to sit there all cranky and crabby trying to cut out felt people -- which I didn't excel at. Sigh. 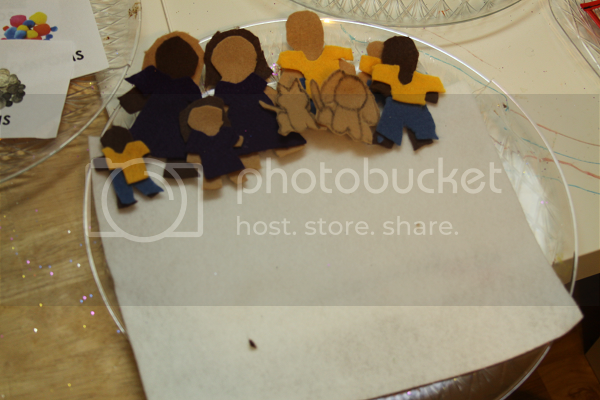 This was just an open-ended fun activity for Ethan to be able to build a family using felt people and to learn that all families are different. The first family he created was ours, and then promptly noted there weren't enough cats. Oops. 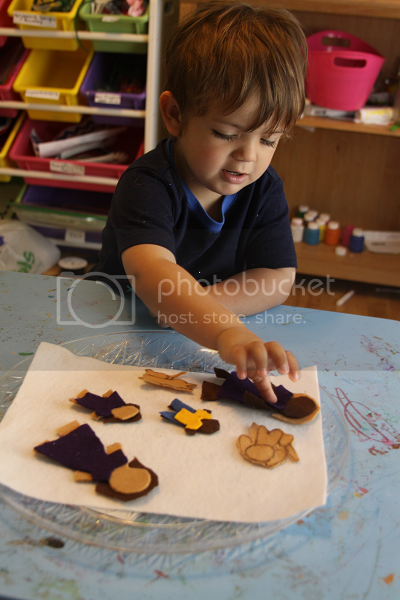 But he had fun making all sorts of combinations of families and it made my hard work worth it -- especially because he usually ignores any and all felt activities! The sweeping is too cute!! Love the felt family, too. Fun!